Soup season is here. I love it. I might talk about soup two times a week, throwing out ideas, in hopes of making more soup. There is something about it. A bowl of pretty much the basic stuff, but there are always extras laying around to throw into the pot. Me? I’m hot sauce, herbs, chilies, fried garlic or shallots. Heck, sometimes an egg, a little more something, something. Who knows? That’s the great question about soup, and something that I always love. I mentioned in the past about how much I love Filipino chicken tinola. It is a Pinoy recipe from what I know from my father-in-law, and one of pure comfort. The soup is a take on classic chicken soup in its basic form, but jazzed up a bit. 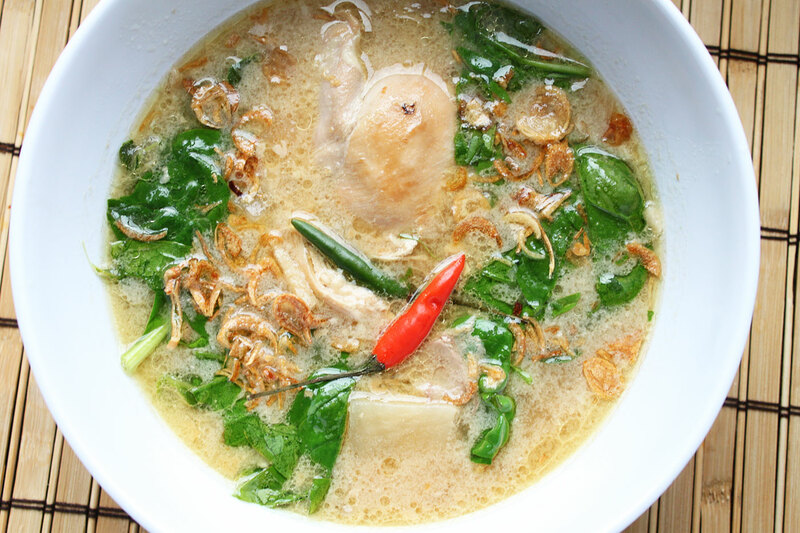 This type of soup is what makes us happy and warms our body. Coconut milk, Thai chilies, chicken? Ready? This is (my take) Filipino Tinola Halang Halang. Start by heating the oil in your large dutch oven, or medium sized soup pot, on medium heat. Next, add in your onion and ginger and give that a stir, cooking until it slightly begins to softens, about 4 minutes. Next toss in the garlic, and give that a good stir, cooking for about a minute. Now add in your chicken pieces, moving the onion mixture around so that you are able to brown up some of the chicken skin. Cook the chicken for about 20 minutes, turning halfway through. After 20 minutes, add in the lemongrass, chicken stock, water, coconut milk, salt, pepper, and fish sauce. Add in the potatoes if you will be using them. Give this a good stir. Cover, and cook this mixture on medium-low heat for about 30-45 minutes. Lastly add in the bunch of spinach, and Thai chilies, and give another stir. Cook for about 10 more minutes or until the spinach is wilted and cooked through. Now it is time to serve. Ladle in the soup into your bowl, making sure you get pieces of chicken, potatoes, onion, etc. Garnish with more chilies should you desire or some fried shallots and get ready to dig in. I like to serve mine with a side bowl of rice. This allows me to spoon some of that wonderful coconut broth and then chase it with some rice. 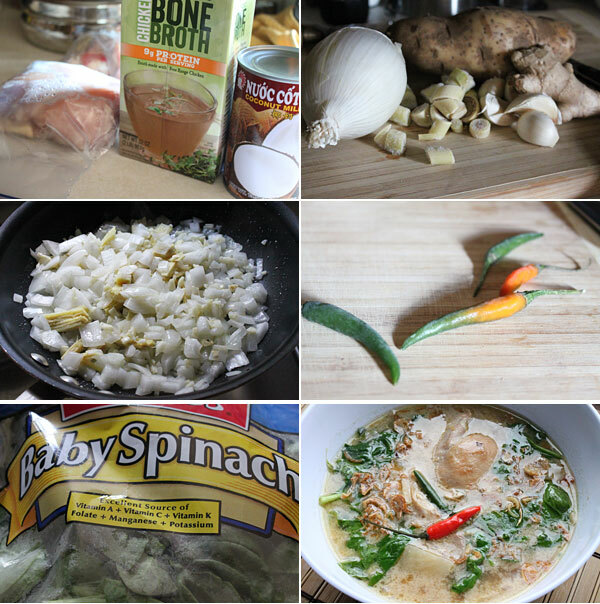 This is everything you will love about Filipino tinola, but one with a twist. I mean you can’t go wrong with coconut milk, chilies, and chicken soup on a cool, Fall day. Hope you enjoy!